One of the tasks which Morris’s political commitments and writing enjoin upon us is to work out what an effective socialist poetry for our own time would look like. Morris himself offers a range of possibilities from ‘All for the Cause’ and ‘Socialists at Play’ to the developed narrative of ‘The Pilgrims of Hope’ – none of which can be very easily taken over as direct models 130 years later. 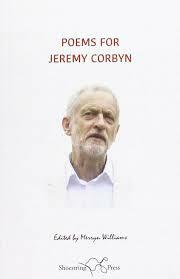 However, Merryn Williams’s welcome collection of Poems for Jeremy Corbyn (Shoestring Press, 2016) does provide an opportunity to assess what works and what doesn’t in this field; and the current general election campaign, which is going to be a major test of Corbyn and Corbynism, is a good moment to think about this. Then there are more searching modes of political poetry, also well represented in this slim volume. How does one praise a leftwing leader without lapsing into pious hagiography? Diane Coffey’s ‘The Socialist’ is perhaps just a tad too worthy in its salute to Corbyn, Merryn Williams’s own ‘Poem for Jeremy Corbyn’ is in contrast more muted and indirect, and Paul Groves’s ‘At the Marquis of Granby’ effectively gives us an encounter with Corbyn which also factors thoughtfully into itself this issue of stance towards the leader. Or how does one situate pressing current struggles in longer historical perspectives? Some of the poems here locate us simply, though effectively enough, in the past, as with Alan Brownjohn’s ‘A Scream in 1890’, which takes us back to the working-class experiences of Morris’s own lifetime. Closer to our own time, Simon Curtis’s ‘In the Scillies’ is a fine reflection on the Labour politics of the Wilson government, though, as it also acknowledges, it does get a little too caught up in ‘elegaic tropes’, in what we have come to call ‘leftwing melancholy’. Finally, how does one express hope without ignoring the grim realities of the contemporary world situation? Mark Haworth-Booth’s ‘The Anthropocene’ is a strong evocation of the ecological dimension of the current crisis, but so exhaustive is its grim synopsis that it perhaps evaporates rather than stimulates hope, while, on the other side of the argument as it were, the explicit evocations of hope in this collection – ‘hope of a nation lay in only one man’s fight’, ‘but really it’s all/about hope’, and so on – strike me more as willed affirmations than as convincingly embodied in the verse. So it is clearly the case that Merryn Williams has made a most admirable gathering of Corbyn-inspired verse, which gives us much both to enjoy and to argue about. In the good old days, Tony, you could actually include the word "socialist" in the title of your poetry volume, as with Alan Bold's 'Penguin Book of Socialist Verse' (1970) or Thurso Berwick and T.S. Law's collection of the 'Socialist Poems of Hugh MacDiarmid' (1978). I wonder exactly when it became impossible to use the adjective? Yes, it would be interesting to track that moment down, though I'm not sure how much precision is possible in such historico-semantic quests! 'Socialist' is not a term I myself would use for Corbyn, though - he's a classical social-democrat, as far as I can see (as the Labour Party itself was, until it was Blairised into New Labour). I'm glad he's recovered some energy and impetus for the election campaign, however - may things turn out well tomorrow!